Before making the final dispatch, our entire lot is carefully stored in our capacious warehouse under the administration of experts. Thus, there are minimal chances of defects at buyer's end. By making use of quality packing material and with the assistance of our experts, we are able to meet diverse packaging requirements of the clients with ease. Thus, we make sure zero damage at client's end. 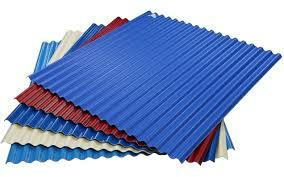 Our Galvanized Iron Corrugated Sheets have a shiny finish on the surface with high precision and durability.